Exhibition of "Artist Impression of An Ancient Belgium"
Belgium has produced numerous painters in its many historical and beautiful old cities. It is a country rich in artistic stimuli. As part of the activities of our organization, we sent four Japanese artists in Western style painting and in Japanese style painting-Hiroshi Okutani, Hidetoshi Otsu, Tomoyuki Takizawa, and Izuru Seki-to Belgium to gather information. They exhibited together in one place the results of their investigations in large and small works of art expressive of their individual viewpoints. The history and culture of those old cities comes vibrantly to life, and these works have been highly praised by many visitors. 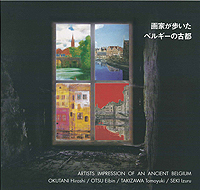 Prologue to the "Ancient Cities of Belgium by Wandering Artists"
Copyright (C) 2002-2018 The Japan Association for the Promotion of Arts, All Rights Reserved.